“Steve Harvey” exits Chicago for L.A. In the latest blow to Chicago’s production community, Steve Harvey’s daytime talk show strip is leaving Chicago’s NBC Tower for Los Angeles, costing one hundred local staffers their jobs. As first reported by Robert Feder this morning – and had been speculated for the past year, Harvey’s program is expected to move to Southern California soon as he was seeking a change of format, which would be more celebrity-driven as opposed to featuring on relationships and everyday people. In other words, look for the series to be similar in tone to Ellen and Live With Kelly. Harvey is also getting a new production team. Talent agency IMG is taking over production from Endemol Shine North America, who produced the show for the last few years. It helps to note Ari Emanuel – Mayor Rahm Emanuel’s brother – is head of IMG. Harvey would have more of an ownership stake in the show. In addition, the show is expected to re-titled next season. The one thing not changing is Harvey’s syndicator – NBCUniversal Television Distribution is continuing in that role and will continue to be carried by NBC-owned stations, including WMAQ-TV here. With the changes now in place, NBCUniversal is now seeking renewals for the show. Unlike the departures of former Chicago-based talkers Jerry Springer and Steve Wilkos – both moved to Stamford, Conn. in 2009 in order to take advantage of tax credits the state was offering, the financial situation here is different – producing the show is actually more expensive in Los Angeles than in Chicago – which made negotiations difficult. But Harvey believed any financial shortfall would be made up due to potential increased ratings from the new format. 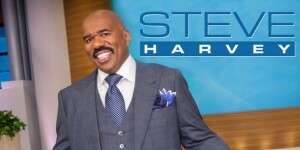 In Nielsen’s recent ratings roundup of syndicated programming, Steve Harvey earned a 1.7 rating for the week ending October 30, up 6 percent from the previous week. Harvey ranked fourth among all syndicated talk shows. This is not the first time a talk show host has sought to completely reboot his format after a long run – in 1998, Maury Povich traded in his general-topic format for a more salacious and raunchy one, DNA testing (“You’re Not The Father!”) and all. In the process, Povich changed syndicators from Paramount Domestic Television (now CBS Television Distribution) to Studios USA, now NBC Domestic Television Distribution, who also currently syndicates Springer, Wilkos, and Harvey’s shows. Harvey’s plate has gotten full since his talk show began. In addition to hosting Family Feud and his radio show (both are produced in Atlanta), he’s also hosting Little Big Shots, expected back on NBC next year, and Celebrity Family Feud. Both are shot in Los Angeles. For Chicago, the exit of Steve Harvey leaves the city with just one nationally-syndicated series based from Chicago’s NBC Tower – courtroom show Judge Mathis and no talk shows whatsoever (aside from local program Windy City Live.) In addition to the departure of Springer and Wilkos, Oprah Winfrey ended her talk show in 2011, and closed Harpo Studios’ West Loop location in 2015, which was torn down recently. It is unlikely we’ll see a new show replace Harvey in Chicago anytime soon, as many stations are steering away from nationally syndicated fare in daytime and producing more local news and programming to fill time periods. So far, only one talk show is being pitched – Drew Barrymore’s new project from Warner Bros. being executive produced by Ellen DeGeneres – and yes, this program is expected to be shot in L.A. if it goes forward. Syndication, Television	Ari Emanuel, Celebrity Family Feud, Drew Barrymore, Ellen, Ellen DeGeneres, Family Feud, IMG, Jerry Springer, Judge Mathis, Little Big Shots, Los Angeles, Maury, Maury Povich, NBCUniversal Television Distribution, Rahm Emanuel, Steve Harvey, Steve Wilkos, Syndication, Warner Bros.